WeatherMaster WMR250 3.4m x 50mm Belt Barrier | Order Today! If you are in need of a belt barrier that can stand up to being left outside 24/7, then the WeatherMaster line of products is the range for you. If you are creating queues outdoors for fairground attractions or events or cordoning off a work zone, then you are in luck. The WeatherMaster system has some great features that are 100% unique to the line. These features include a durable rubber recycled base. Carry handles incorporated into the rubber base, and an easy to disconnect pole. Just because the WeatherMaster is designed for outdoor use that does not mean it has to be kept outdoors. The Weathermaster 250 can be used in factories and loading areas just as efficiently as outside. 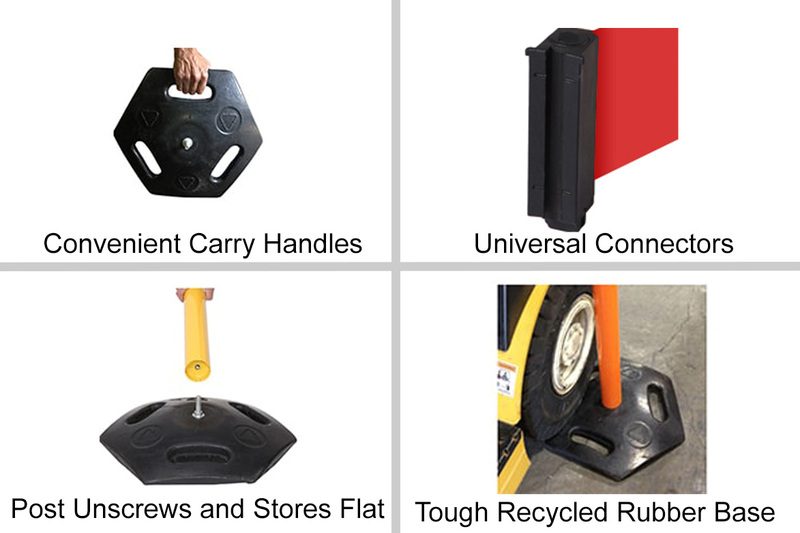 The rubber base can take being run over by forklifts and other equipment with ease. Heavy Duty Rubber Base - The base is made from recycled rubber and can take being run over by forklifts and similar equipment. This durability makes it ideal for loading bays and docks. Carry Handle on The Base - Makes carrying the base (the heaviest part of the system) easy. Ideal for mobile site works. Easy To Unscrew Post - This allows the set to be stored flat for convenient transport. Belt Brake - Slows the retraction of the belt to prevent it whipping around if released. Universal Belt Clip With Safety Catch - Fits all favourite brands of belt barrier and incorporates a clip to prevent accidental unclipping. Vibrant Colouring - Makes this belt ideal for commercial areas and fairs. It is easily seen even in low light conditions. The 250 has a 3.4metre belt length, with the option of special-ordering the 3.9metre version. The 300 model features a longer 4.9m belt length. Each unit is also slightly wider and heavier to accommodate this. The SafetyMaster range is similar and weather resistant (rather than weatherproof). Our sales team are waiting to take your call and answer any questions you may have about the WeatherMaster range of products. They can be called on 01905 794 875 during office hours.